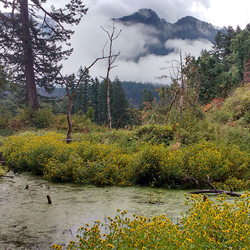 Wednesday, Mar 6, 2019, 9 a.m. – 4 p.m.
An extensive network of professional, academic, and amateur botanists are actively engaged in the conservation, management, and study of Washington’s diverse flora. Their expertise ranges from how best to manage biodiversity, to understanding climate change impacts on plant communities, to naming and classifying the flora’s rare, common, and invasive elements. Invited speakers and poster presentations will share new insights and discoveries about these topics and more. Participants from throughout Washington and adjacent areas will have the opportunity to exchange ideas with colleagues within and across disciplines.Lunch is included. Reception follows. Remote attendance: You may choose to attend remotely via web conferencing. Our goal is to provide an environmentally-friendly alternative to long-distance travel and increase access to the conference for remote participants who would otherwise not be able to attend. Participants who register for remote attendance will be sent log-in instructions via email before the the symposium. Poster session: Attendees are invited to share recent work during the poster session for no additional charge. Lunch and reception included with in-person registration.